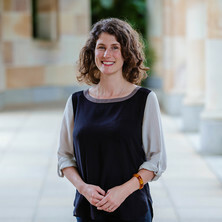 Dr Susannah Chapman is a Research Fellow at The University of Queensland. Susannah joined the Law School in 2016 as part of a research team working under the leadership of Professor Brad Sherman, ARC Laureate Fellow, on the ARC Laureate project ‘Harnessing Intellectual Property to Build Food Security’. Dr Chapman was awarded her PhD in Anthropology from the University of Georgia in 2014. She has previously worked at the University of Georgia, St. Mary’s College of Maryland, and the University of The Gambia. Chapman, Susannah (2018). Regulating the circulation of intangibles: end point royalties, intellectual property, and transformations in food production. In: Society for Social Studies of Science Annual Conference, Sydney, Australia, (). 29 August - 1 September 2018. Chapman, Susannah and Brown, Tom (2013). Apples of Their Eyes: Apple Trees and Memory Keepers of the American South. In Virginia Nazarea, Robert Rhoades and Jenna Andrews-Swann (Ed. ), Seeds of Resistance/Seeds of Hope: Place and Agency in the Conservation of Biodiversity 1st ed. (pp. 42-64) Arizona USA: University of Arizona Press. Chapman, Susannah and Heald, Paul J. (2012) Veggie Tales: Pernicious Myths About Patents, Innovation and Crop Diversity in the Twentieth Century. University of Illinois Law Review, 2012 4: 1051-1102. Chapman, Susannah (2018). Regulating the circulation of lively biological property: traceability, quality, and trade mark in the market for Calypso mangoes. In: Fabricating Trust Workshop, Brisbane, QLD, Australia, (). 12 September 2018. Chapman, Susannah (2016). New varieties, agricultural experts, and "Native" farmers: the politics and power of recognition in British Colonial Gambia. In: American Anthropological Association Annual Conference, Minneapolis, Minnesota, (). 16-20 November 2016. Crop Diversity Report Card for the Twentieth Century: Diversity Bust or Diversity Boom?